Up close and personal to bottle-nose dolphins. in SeaWorld's newest marine attraction. Kids making fast friends while romping in the water is part of a beach vacation's charms. But frolicking with Dixie proved to be special. We splashed, swam, tickled her tummy and body surfed together. No ordinary playmate, this 480-pound dolphin liked it when we climbed on top of her, grabbed her flippers, and held on as she zoomed us into shore. Even my often blase teen Alissa dubbed the encounter "awesome." 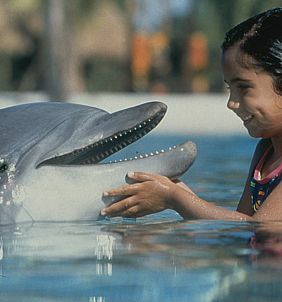 Getting nose-to-bottlenose with Dixie created a family event we'll remember forever. Dixie is just one of the dolphins you can get wet with at Discovery Cove, Orlando, SeaWorld Orlando's sister park. An animal lover's dream and a parent's delight, Discovery Cove, which opened to the public in July, is a new kind of attraction. It delivers the best of a marine park's animal encounters-dolphin swims , snorkeling, and bird adventures-- in a resort-like setting of river pools and sandy beaches. By limiting attendance to around 1000 guests, Discovery Cove promises no crowds and by providing splash lagoons, a lazy river ride and plenty of lounge chairs, Discovery Cove did what we had thought impossible: create a relaxing day at a theme park, one without long waits. Exploring an underwater world. Exotic fish surround guests as they explore the remains of a shipwreck and hidden grottos amid the colorful bursts of coral. 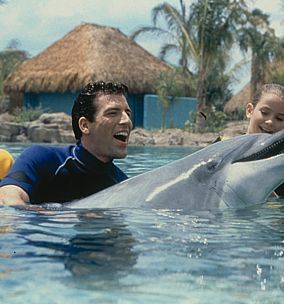 Alissa and I have buddied-up with dolphins before - in the Bahamas, Honduras, Bermuda and other places. 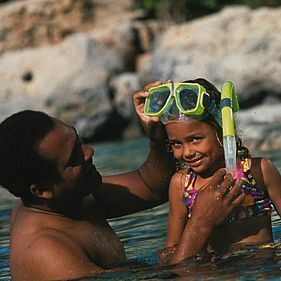 Discovery Cove's swim-with-dolphins experience is among the best such programs because it's safe, fun and educational. At other places some encounters were brief 30 minute wade and touch sessions, which while informative, felt too brief for the bucks. At another dolphin institute we were dumped in a fenced off bay with six other participants and surrounded by a school of swift moving friends of Flipper, a chaotic and potentially dangerous experience. But Discovery Cove's 90-minute encounter, which includes almost an hour in the water, is carefully controlled. Each experience begins with a brief lesson about dolphin physiology and habitats. Then three guests wade into the shallow end of a lagoon under the watchful eyes of two trainers. We learned hand signals. When we twirled a finger Dixie swam out and spun in the air, becoming a dancing dervish. When we held up both hands and waved, Dixie scooped water up and dumped it on us. To reward her, we employed positive re-enforcement: cheers, claps and fish. The first two came easily, but tossing handfuls of dead, silvery critters took some getting used to. However, Dixie's excited clicking and expectant looks even convinced my vegan daughter to reach into the bucket for Dixie's slimy reward. After getting acclimated, we took turns swimming in the deep water with Dixie, who circled us, showed off her tail spin, let us pet her rubbery belly, and otherwise endeared herself to us. By the time she gave us a kiss goodby, we were thoroughly charmed. While Dixie and her dolphin pals are the highlights of Discovery Cove, they're not the only animal encounters. As you walk through the park, you meet handlers carrying interesting creatures. We saw a sloth, touched an anteater and held Rio, a green winged macaw. And much to our surprise, we even found the aviary exciting. Exotically colored birds flitted from branch to branch, waddled across the paths, and ate from our hands. Little kids fed worms to turquoise blue vulturine guinea fowls, and blacksmith plovers. Too squeamish, we settled for throwing fish to the storks and ibis and giving the gray go-away birds and other interestingly plumed species biscuits covered with fat and a fruit mix. 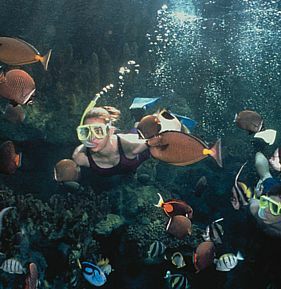 In the snorkeling lagoon, which wasn't quite complete at our visit, you can wriggle through schools of tropical fish and come safely face to face with barracudas and sharks that lurk on the other side of the snorkeling cove's clear acrylic partition. In the ray lagoon, slither along with hundreds of cownose and southern rays. We can't wait to come back. We miss Dixie, the birds intrigue us and we want to try the snorkeling. However, a day at Discovery Cove, while a good value, is pricey. 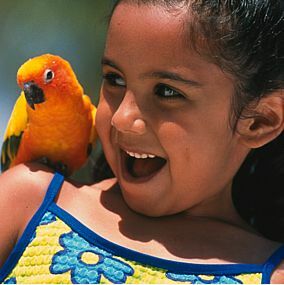 The general admission of $179 includes lunch, a dolphin experience, unlimited access to the swimming, snorkeling and the aviary as well as use of a locker, towels, and beach chairs plus a pass for 7 consecutive days admission to SeaWorld Orlando. Dolphin encounters at other places have cost us between $100-$150, so the $179 price for a day is reasonable, especially considering the other attractions and the week-long admission to SeaWorld. For those who do not want to swim with the dolphins, as well as for children ages 3-5, admission is $89 and the same activities and amenities are included. The minimum age for the dolphin swim is 6-years-old. Kids younger than 3 -years are free. Discovery Cove provides a delightful day. We just have one minor complaint. It's often hot in Orlando and we found ourselves frequently lining up for juice, soda and water. For $179 per person, we wish Discovery Cove would throw in free non-alcoholic drinks. They don't. Expect to rack up additional charges in drinks for a thirsty family of four. Discovery Cove, 6000 Discovery Cove Way, (877)-4-DISCOVERY, www.discoverycove.com is adjacent to SeaWorld Adventure Park, Orlando, Florida. The Renaissance Orlando Resort, located near Discovery Cove, offers the Discovery Cove Adventure Travel Package through December 20. The package includes two nights accommodation, breakfast for two each morning, one dolphin swim and one non-swim admission to Discovery Cove, and two 7-day passes to SeaWorld Orlando for $555 plus tax. Additional nights and theme park tickets may be purchased. Call 877-846-3555; www.renaissancehotels.com. Candyce H. Stapen is the author eight travel books, including National Geographic Guide to Family Adventure Vacations: Wildlife Encounters, Cultural Explorations and Learning Escapes in the U.S. and Canada. (National Geographic, April 2000).